Lee Sellars, Lawrence Kao, Kurt Kwan and Leah Anderson in THE GREAT LEAP. Photo by Dan Norman. The first time I heard Lauren Yee’s The Great Leap at a reading, I was close to crying most of the time. Not because the play is sad—it’s very funny—but because the play made me the most homesick I’d ever been – after living in the U.S. for three years. 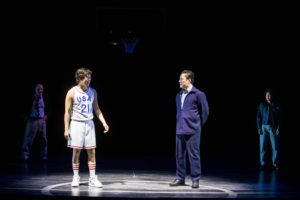 The play (at the Guthrie, through Feb 10) is centered on a basketball game in 1989 Beijing, between the University of San Francisco (USF) and Beijing University. The players of the game are Manford Lum, a 17-year-old relentless, cocky big-mouth from San Francisco who shoots one hundred free throws before bed every night; Connie, Manford’s 25-year-old cousin/neighbor/informal guardian in San Francisco, relentless in her own intellectual ways; Saul Slezac, coach of the USF basketball team (who famously said in Beijing back in 1971, “No Chinese team will ever beat an American team”); and Wen Chang, then translator for Saul in 1971, now coach of Beijing University’s basketball team. Wen Chang remembers Saul’s infamous line and invites Saul’s team to Beijing for a friendship game eighteen years later. I remember characters like this growing up in Hong Kong (which wasn’t — and isn’t — Communist China, but Chinese-ness extends beyond the reach of the Chinese Communist Party). I saw things like my grandfather struggling to learn English. I saw the sacrifices my parents made. I learned how to suppress emotions (Did you notice I said I was “close to crying”?). In America, I’d felt cultural differences before, but hearing them articulated through Yee’s sharply perceptive and deeply empathetic writing brought on strong feelings of recognition and nostalgia. But to say this play is about cultural differences would be a huge injustice to the brilliant Lauren Yee. The world of basketball resounds with ideals of resilience, ambition, sacrifice, opportunity, allegiance, even biology—the pursuit of which spills over to the private lives of the players, transcending time and borders. The metaphor of basketball informs the play: the play’s language, rhythm and structure are crafted to mimic the rapidfire back-and-forth of a basketball game, and Desdemona Chiang’s staging carries that intention through effectively. With the aid of Paul P. Whitaker’s lighting, the actors keep the energy radiant on the McGuire Proscenium Stage, where its spaciousness can seem to dissipate a play with such a small cast. I didn’t cry at last night’s performance, but the familiarity was there–not just of the play, but of the stories. Yee, Chiang, and the cast share an understanding. It’s the understanding of the deep-seated pain when Wen Chang explains that you don’t want to be someone in Communist China, because “being someone could get you killed.” The understanding of conflicting values when Saul tells Wen Chang, preacher of patience, that “it is always your turn”. Understanding racist stereotypes — “No Chinese is ever gonna be good enough to play in the pros”. (Hey there, Jeremy Lin.) Understanding that running might promise progress, but standing still might not mean stasis either. And of course, understanding that you should take your shoes off to enter a Chinese home.